We will get to the donuts in a bit. Let’s digress with some history and backstory for a distraction. 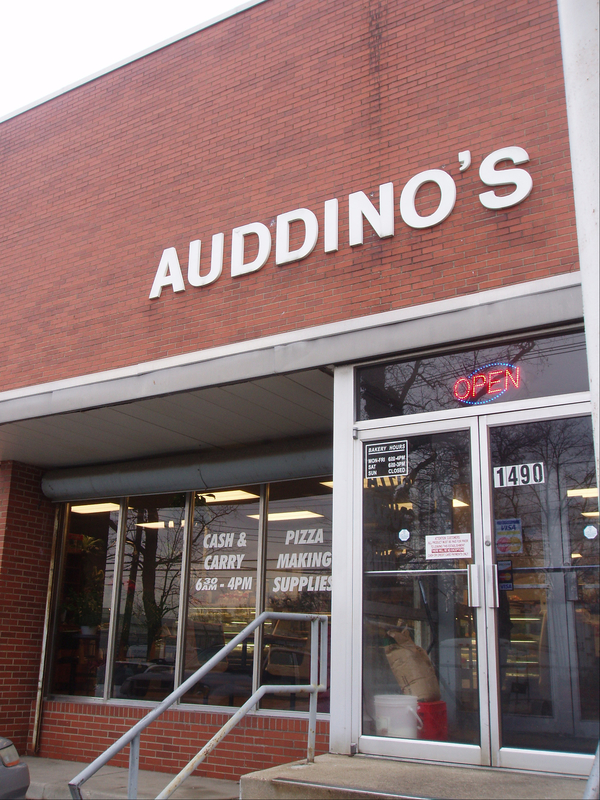 I have eaten Auddino’s baked goods my entire life, but I rarely knew it. This Italian bakery supplies breads, buns, rolls and all types of flour based goods to at least one half of the Italian restaurants in town and who knows where else. The Auddino’s immigrated to Columbus from Italy in 1966 and have grown a gigantic following of loyal regulars in the last four decades. They even have a second location in Florida so that Columbus snowbirds are not deprived of their sweet treats. The bakery moved to their current Linden area location in the 1990’s. This is a large volume bakery but they have set aside enough counter space to sell everything they offer to the public. In addition to cash and carry baked goods they sell some hard to find Italian-American grocery items such as olive oils, giardiniera, sauces, sardines, and such. When I parked, a car pulled up beside me. My friend Matt popped out. He was surprised this was my first time here so he provided the rundown on what I should get. He confirmed that everything was awesome but he wanted to make sure that I ordered a few critical items. 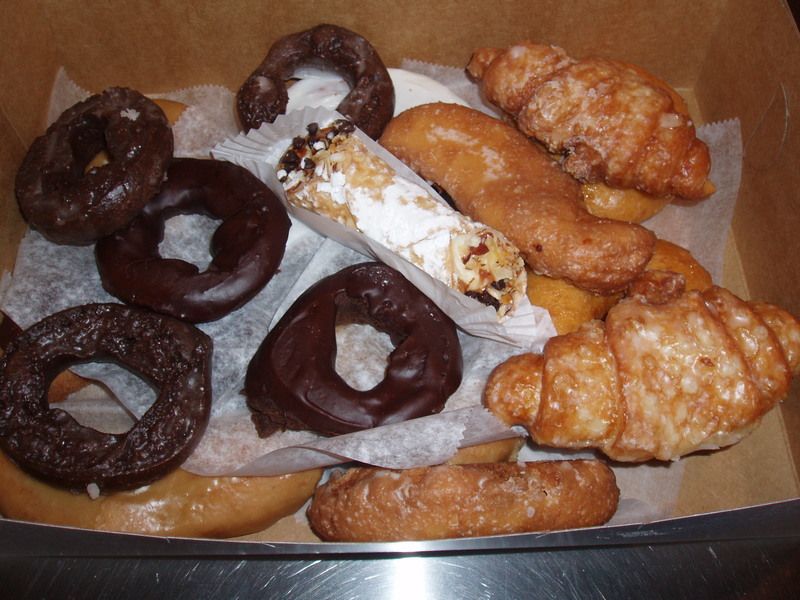 The critical items are: glazed croissants, cannolis and apple fritters. I can confirm that these are all wonderfully perfect. The glazed croissants come in two sizes regular and large. Some have a light drizzle of chocolate. These were fresh, perfect and would meet any Frenchman’s approval with or without sugar. These are the best in Columbus. I have searched for a good cannoli in Columbus for about ten years. I never found one that ceased my craving. 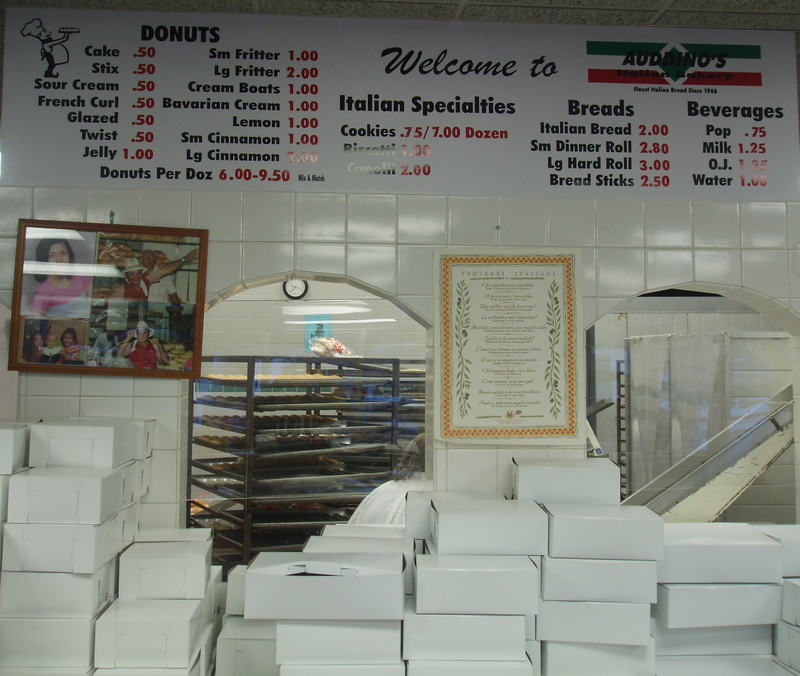 Auddino’s cannolis are among the better versions I have tried in the United States (this includes: what I have sampled in Little Italy neighborhoods of Chicago, San Francisco, Boston, Baltimore, Philadelphia….and (for the price to value range) New York). As for the apple fritters – I may need to have an fritter throwdown but I believe these are as good as or maybe better than the apple fritter at Resch’s Bakery. If you have the impression that I was impressed you are correct. I visited the bakery on a Saturday. Mama and Papa Auddino were minding the counter serving regular customers they know by sight and order. Most of the transactions were small – a bag of sandwich buns or a loaf of bread. The Auddinos are a kind and sweet elderly couple that might be described as hobbits with Italian accents. I approached the countered stating I wanted to “get a lot of donuts”, mama said “wait a minute while I get this person, I know what he wants”, she passed me off to papa who said the same thing. After a bit of gourmand ping pong one of them finally picked me and my ordering began. Auddino’s has most of the standard donuts selections – none were perfectly formed which is a good sign in my donut consumption experience. Stick donuts come plain or with a vanilla or maple glaze. In my donut investigations, any legitimate Ohio donutery must offer the maple option. I picked up one or two of each donut offering including two standard donut doughnuts. These all looked good, smelled delightfully “donuty” and felt fresh to the touch. I fought my inner consumption demons not to eat them in the lobby. I also noted that papa Auddino seemed to give me a significant discount on my order, he must have sensed that I am in the process of becoming a loyal regular. Instead, I took my donuts to the toughest donut testing team on the planet – the Lopez sisters. These three Puerto Rican princesses have consumed Donald’s Donuts in Zanesville for twenty plus years. Auddinos donuts passed the Lopez litmus test with flying colors. At this point some of you are wondering….um, what about the DK Diner test? I expected Auddino’s to be very good. I was not prepared for these donuts to be audaciously awesome. If I had, I would have picked up a box of DK Diner donuts for a head to head comparison. 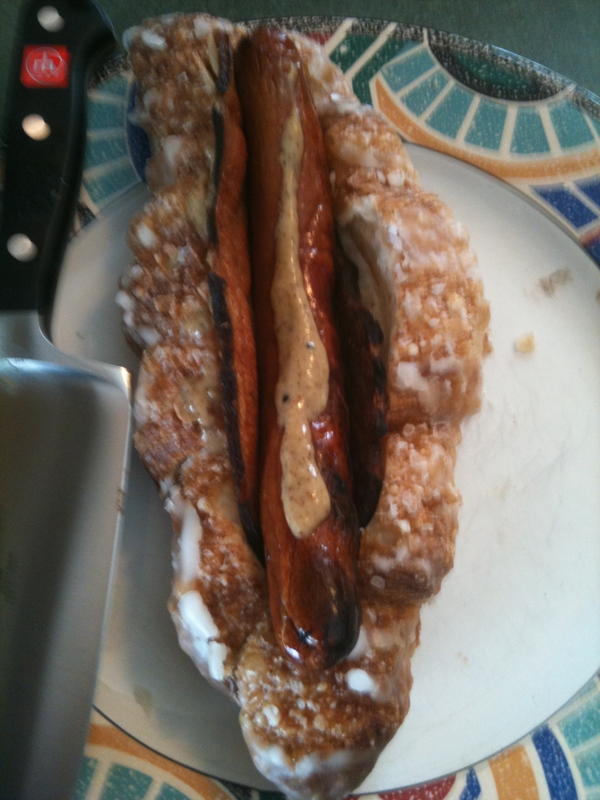 My gut tells me that some individual donut types at DK Diner may still be a bit better. On the flip side, Auddino’s has better variety, the best cannoli on this continent and glazed croissants. For now, pending intensive research over the winter, I will declare Auddino’s and DK Diner tied for best in Columbus. Additional Ohio research trips in Dayton and Springfield are in the works to declare an overall winner.